100% of the authors’ proceeds from the book will directly benefit Challenge Success. During our first decade, we have learned what works and what doesn’t when trying to make changes in schools and in homes. At the urging of those who have worked closely with us, we decided to write a book of best practices that we hope will be shared widely so that more schools and families can benefit from what we have learned. Our society’s over-emphasis on grades, test scores, and rote answers has stressed out some students and marginalized many more. We know that these students have lost their enthusiasm for learning and aren’t retaining important concepts and skills. Overloaded and Underprepared: Strategies for Stronger Schools and Healthy, Successful Kids provides the tools needed to begin making immediate changes at school, in the community, and at home that will benefit all kids. 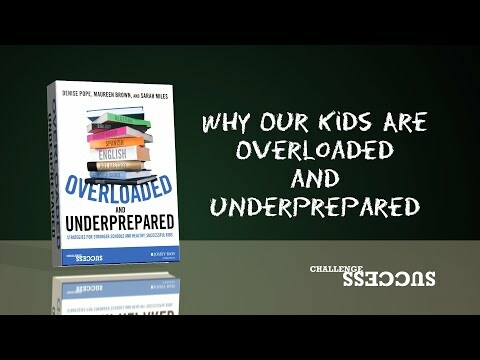 Overloaded and Underprepared helps educators and parents better prepare students — mentally, emotionally, and academically — to handle the challenges they will face in school and in life. Parents, teachers, and administrators are all concerned that America's kids are stressed out, checked out, or both — but many have no idea where to begin when it comes to solving the problem. That's why the work of Challenge Success is so urgent. It has created a model for creating change in our schools that is based on research and solid foundational principles like communication, creativity, and compassion. If your community wants to build better schools and a brighter future, this book is the place to start. Finally, a book about education and student well-being that is both research-based and eminently readable. With all the worry about student stress and academic engagement, Challenge Success synthesizes the research on effective school practices and offers concrete tools and strategies that educators and parents can use immediately to make a difference in their communities. By focusing on the day-to-day necessities of a healthy schedule; an engaging, personalized, and rigorous curriculum; and a caring climate, this book is an invaluable resource for school leaders, teachers, parents, and students to help them design learning communities where every student feels a sense of belonging, purpose, and motivation to learn the skills necessary to succeed now and in the future. Our schools are producing fragile, stressed-out students who achieve at high levels but at a high cost. Any administrator who recognizes this problem but doesn't know where to begin should read this book. It is too easy to blame the college process or demanding parents. We, as school leaders, recreate our schools every fall, and we are responsible for creating healthy learning environments. This book gave my faculty and me a road map, as well as the encouragement to ask the tough questions of ourselves and our community.